Home > Government & Politics	> Are Strikes, Demonstrations and Riots Coming to the US? Are Strikes, Demonstrations and Riots Coming to the US? ]In May it was Greece. June it was France. Will it soon be the US? 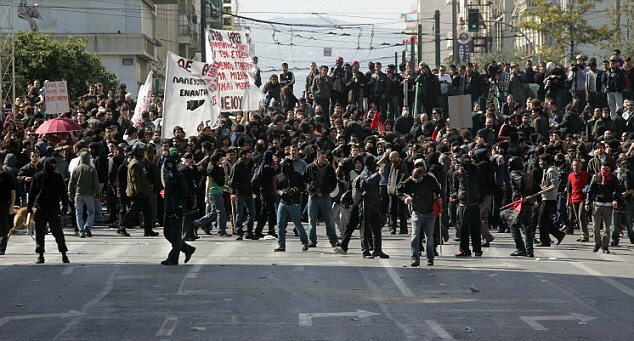 Massive strikes and demonstrations occurred in Greece during early May, which eventually led to a riot in Athens resulting in three Greek citizens being killed. The reason for the civil unrest… people were protesting the proposed austerity measures necessary to keep the government from economic collapse. Some of the “draconian cuts” included eliminating a 14-month pay system (12 months of pay plus 2 month’s salary as a bonus) and extending the retirement age from 65 to 67. In late June, French labor unions led strikes across the country shutting down modes of transportation and causing a widespread reduction of government services. People are protesting President Nicholas Sarkozy’s proposal to increase the retirement age from 60 to 62, to reduce the losses to the national pension system. The strikes occurred in June, even though the French Parliament won’t be debating the measure until September, and the increase won’t take effect until 2018. Greece, France and many Western European nations provide very generous social services to their populations. As the global economic recession drags on, these countries are realizing that their programs are unsustainable for an aging population. For Greece, it took coming to the brink of bankruptcy to make changes. France is trying to be more proactive, but it remains to be seen if President Sarkozy will prevail. A big question for those of us in the US… is this the precursor of what’s to come in the good old US of A? We can argue the differences between economies, politics, and culture all day long, but are we really all that different? At present, the US government is racking up debt to the tune of $3.8 billion dollars of day. This isn’t monopoly money being printing. It’s being funded by selling US Treasury securities to foreign nations like China, big banks and individual investors. What would happen if suddenly people stopped buying our debt? The changes in government spending would be harsh and dramatic. Do you think people would riot if funds for education, transportation or Medicaid stopped coming to the State governments or if Social Security checks stopped coming to seniors? Seem farfetched? Maybe… but maybe not. I’m not an alarmist or a pessimist. I’m actually an optimist. However, I can also be a realist, and I understand one basic financial principle. You can’t continue to spend more than you make forever. You can borrow for a while, but eventually you have to pay it back. Greece’s public debt is currently about $400 billion. That’s huge for their population and economy, but that pales in comparison to the way our government spends money. We’ll add another $400 billion to our national debt by the end of October. This is serious money, and it’s a serious problem. Strikes, demonstrations and riots can be avoided, but things must change soon. The longer we wait the harder it’s going to be to rectify the situation. The present mood and culture in Washington is procrastination and stagnation. I recognize there are no quick or easy solutions, but I also know that the bigger the debt, the fewer the options and the harder it is to fix. If we want to avoid the challenges Western Europe is currently facing, our leaders need to act soon. We probably won’t like every solution they develop, but we’ll like the consequences of doing nothing even less. Yes, exactly right – no time like the present to stop the madness. You really need to compare the ratio of debt to GDP, not absolute debt in each country. Here is a chart that will explain just how close we are to Greece in aggregate borrowing. Wonderful site and theme, would really like to see a bit more content though! Great post all around, added your XML feed! Love this theme, too! Logically, cutting the faith based initiatives program would seem to be the first place Congress needs to look at cutting rather than social security. Faith based initiatives, a new entitlement program, came in with Bush, and has no basis in law as anything but coerced charity through government unlike the vested benefit program of Medicare and Social Security which taxpayers have been paying into since they began working. This overlooked source of savings takes priority over cutting of defense spending or military salaries which could threaten our national defense. Charity begins at home, and survived originally without using government as a conduit for entitlements. Undoing the faith based initiative program – as the last wholesale program included in the government budget is the first that should be cut – simply upon the basis of seniority. Recognizing what America has done wrong is an important part of making it right. If faith based initiatives helped to cause the excess of spending over revenue, it should be cut, and cut first.